Canali tie in foulard pattern. Since 1934, men of discernment have turned to Canali for an Italian luxury wardrobe. To ensure garments of the finest quality, each piece is created following the strictest manufacturing. Suits, sport coats, and trousers are the product of expertise not only in impeccable style and taste, but also in culture and history. Materials and silhouettes are selected by Canali with the utmost precision. Ermenegildo Zegna tie featuring alternating leaves motif. Approx. 3" at widest. Silk; dry clean. Made in Switzerland. 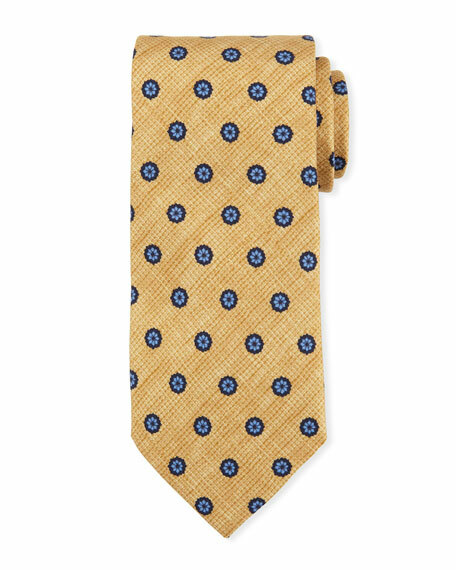 Ermenegildo Zegna tie featuring chain link motif. Approx. 57"L; 3.5" at widest. Silk; dry clean. Made in Switzerland. EXCLUSIVELY AT NEIMAN MARCUS Ermenegildo Zegna tie in micro geometric pattern. Silk. Made in Italy. Eton tie featuring chain link pattern. Approx. 58"L; 3.5" at widest. Silk; dry clean. Made in Italy.